I am just soooooo lovin’ this set! I know when they showed it to us during the catalog preview I just couldn’t wait to get my hands on it. Since it was ‘sitting on top of my desk’ since I had done this card on Saturday and this card on Tuesday, I figured it would work perfectly for the color challenge this week on Create with Connie and Mary. Hmmm…I think I was right. I think this just turned out sooooo cute! and would be perfect for a more masculine or especially for a teen card! 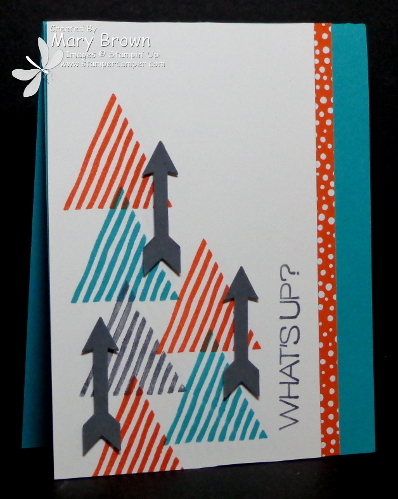 Punch out arrows from Basic Grey using the What’s Up punch and add to card using dimensionals. Set(s): What’s Your Type?, What’s Up? This entry was posted in Create with Connie and Mary and tagged Wha't Up, What's Your Type. Bookmark the permalink. Love how you used the punched arrows (in multiples) and the way you stamped the sentiment “going up”! Such a FUN card! I thought this set was so cool but then I didn’t know how I would use it. Love your card! What a great way to use the stamps and punched arrows! The sentiment and arrows are a perfect combination! Fun card! I love your card Mary! I wasn’t too sure about What’s Your Type, but I really love what you are doing with it! the arrows and the greeting are so fun! This would absolutely be a great teen or guy card, for sure!! Love how you laid this out, and those little arrows are perfect! Fun card!